An explosion on board Apollo 13 has caused one of the most critical situations in American space history and put the lives of the three astronauts on board in severe jeopardy. The explosion happened in the fuel cells of the spacecraft's service module approximately 56 hours after lift-off. This resulted in the loss of Apollo 13's main power supply which means oxygen and water reserves are now critically low. The safety of the three astronauts, Captain James Lovell, Jack Swigert and Fred Haise, is uncertain although Nasa is hoping emergency contingency plans will ensure their safe return. The cause of the explosion is not yet clear although it is understood it could have been the result of a meteorite crashing into the service module. It is unlikely the exact cause will ever be ascertained as the service module will burn up before the spacecraft's re-entry into the earth's atmosphere. The crew are currently surviving on the emergency battery power supply of the lunar module, Aquarius. If the accident had occurred after the lunar module had been detached for the moon landing, the astronauts would have faced certain death. The spacecraft's main computer has now been switched off to conserve what little power remains in the command module, Odyssey, as this part of the spacecraft will be required for re-entry into the earth's atmosphere. Plans have been made to "slingshot" Apollo 13 around the Moon and fire the spacecraft's last remaining booster engine to take it away from the Moon's orbit and bring it back on course to Earth. This is a highly risky operation and there is no back-up should anything go wrong. If all goes to plan Apollo 13 is due to splash down at approximately 1900 BST on Friday 17 April. The Apollo 13 mission was to have been man's third Moon landing. The spacecraft was due to land in the Fra Mauro area of the Moon on Thursday 16 April. Captain Lovell and Mr Haise were due to carry out geological experiments on the Moon's surface as part of an ongoing project to establish the true age of the Moon. Rock samples taken from previous missions have been dated as being 4,500 million years old. 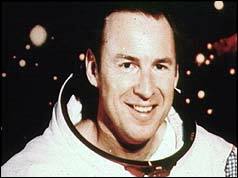 During the 33-hour Moon landing Mr Swigert would have been responsible for piloting the command module in lunar orbit. Mr Swigert replaced Thomas Mattingly as command module pilot just hours before the mission began after it was found that Mr Mattingly had no immunity after exposure to German Measles. Apollo 13 successfully returned to Earth on Friday 17 April 1970. The spacecraft entered the atmosphere 400,000 ft (121,920 metres) above the Earth and hurtled towards Earth at 25,000 mph (40,234 km/h). The command capsule splashed down in the Pacific Ocean at 1907 BST. The lunar module and the service module had been jettisoned before re-entry into the Earth's atmosphere. Within three minutes of the capsule landing helicopters were on the scene. The three astronauts were airlifted onto rescue boat Iwo Jima where they spent the night before flying to Samoa to be reunited with their families.